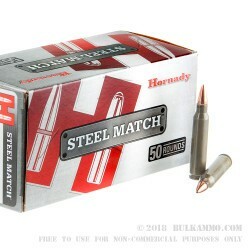 The Hornady Steel Match ammunition line up is a quality product with a great price point. 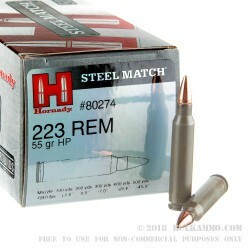 They are able to keep the ammunition costs on the lower side of the spectrum by using steel cases instead of brass, yet they are able to retain a high level of accuracy by using their own Match Grade bullets. 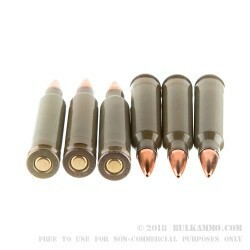 These rounds are topped with 55 grain copper jacketed HP (Hollow Point) bullets with a cannelure cast into the body. 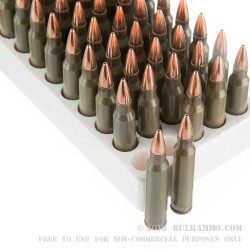 These match grade rounds are loaded into thick walled, heavy duty, new, non-corrosive Berdan primed steel cases. They have a muzzle velocity of 3240 feet per second, and a heavy hitting muzzle energy of 1282-foot pounds. They are packed up in 50 round boxes, with 10 boxes to a case of 500 cartridges. These loads are perfect for your trips to the range, and any family shooting excursions with your new rifle. Grab a few cases today. Hornady has a long-standing reputation for quality, accuracy, reasonable cost, efficiency, and tremendous effectiveness. Since Joyce Hornady founded the cartridge company in 1949, they have manufactured products that have changed the world of ammunition. Based out of Nebraska and owned by Steve Hornady, they have continued to make quality ammunition components, reloading gear, and other products in the firearms world.